D-Orbit is an Italian start-up founded in 2011, offering a modular and indipendent device to dipose satellites at the end of life. D-Orbit has also an american branch, to address the american market (Credits: D-Orbit). Luca Rossettini, CEO and co-founder of D-Orbit, a start-up targeting the space debris mitigation market, has always dreamt of going to space. 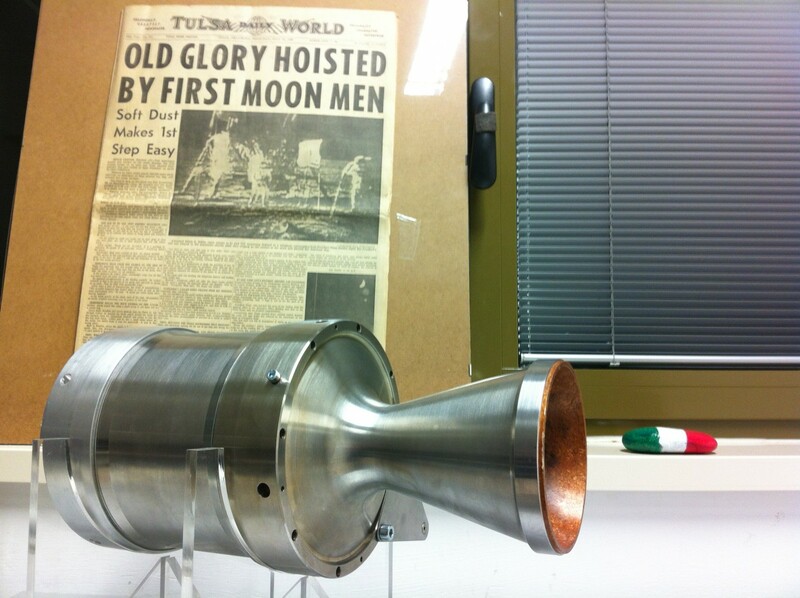 His dream led him from Italy to the US and back, with a revolutionary idea and a reliable business plan on how to deal with satellite disposal. Before starting D-Orbit, Rossettini joined the Italian army as a parachute officer and attended Politecnico di Milano, graduating in aerospace engineering after a period in the US studying nanotechnology applied to space propellants. In 2008, he applied for ESA astronaut selection, being shortlisted among the final 200 candidates. Rossettini got a PhD in advanced space propulsion at Politecnico’s Space Propulsion Laboratory in 2010. Before that, in 2005, he also obtained a Masters in strategic leadership towards sustainability – an undertaking that became an important formative passage in his career. The origin of the idea for D-Orbit has to be dated back to 2008, when Rossettini, reading an article about space tourism, found out that the number of debris orbiting around Earth will be an issue affecting future development of space applications. “Space debris is a huge problem and if we really want to have an easy access to space for everyone, we need to fix the problem as soon as possible,” he says. Rossettini started studying the problem and the solutions, however, at that time there were studies on removal missions but none addressing mitigation. Rossettini was looking for a different way to approach the problem, applying sustainability principles to space debris. He realized that the satellite market was growing at 14% every year, meaning 1,200 new satellites can be predicted to be launched in the next 8 years. “The concentration of something cannot be more than the system is able to absorb on itself,” says Rossetini, “which means the amount of objects you put in space should not increase systematically.” With this drive, Rossettini started developing the first concept of a separate module able to autonomously deorbit satellites at their end-of-life. He approached banks for funding, only to be turned down due to the perceived riskiness of his undertaking. However, in 2009, Rossettini won a Fulbright scholarship to fly to Silicon Valley to develop his business plan and he also got an internship at NASA’s Ames Research Center, working on a small satellite based on mobile technology. At that point Rossettini decided to go back to Italy with a stronger business plan and a solid team, succeeding in getting the needed funding and D-Orbit was established in March 2011. D-Orbit has developed a modular deorbiting device which is based on a propulsive device that can be attached to satellites before launch. “We’re not taking care of debris already there, but we want to prevent the generation of new debris in order to freeze the problem. If you freeze the problem you allow the market to grow even more,” Rossettini says. The device will be able to safely deorbit a satellite from low Earth orbit or bring geostationary spacecrafts to a graveyard orbit. It is designed to work when the satellites are no longer operational, either at the end of life or if there are glitches that make the spacecraft impossible to operate. D-Orbit has chosen to operate with a special innovative solid engine. However, since traditional solid propulsion engines are not restartable, to assure the correct impulse modulation and achieve a safe reentry, D-Orbit’s engine will have different solid propellant cartridges feeding into a single nozzle, resulting in a restartable solid engine. The engine and its control module were successfully tested in January 2012. Image taken with an high-speec camera during the succesful test of D-Orbit engine, in January 2012 (Credits: D-Orbit). Part of the novelty of the concept is that D-Orbit modules are independent from the satellite and designed to be activated only at end of life. The system is basically designed to survive 25 years in space and then to work only once or twice; as a result, the technology and material selection requirements are atypical. Moreover, the system is modular to allow operators to decide which module to install. Rossettini explained that it is very difficult to convince a manufacturer to install a module on their satellites that has not been developed in-house. Therefore, the device is designed to be completely off-line during normal operations, reassuring satellite operators that the module cannot interfere with their primary business. The device only wakes up when the operator decides that the unit is at the end of life. Operators will have the responsibility to plan the reentry and choose the necessary engine to ignite. Although every decision is left to the operators, D-Orbit will provide a real time simulator to advise the customer when to operate the final maneuver to achieve a safe reentry. According to Rossettini, although the D-Orbit device represents additional mass to add at the launch, it is not necessarily an additional cost. Regulations state that manufacturers have to consider a sizeable amount of additional propellant for deorbit maneuvers at the end of life. However, according to ESA, only 30% of GEO satellites are performing end-of-life maneuvers. Rossettini explained that this happens because there are sometimes miscalculation in the amount of propellant but also because deorbiting represents a cost for operators that want to use satellites down to the last drop of fuel. The D-Orbit device will guarantee that additional months of operation do not come at the cost of deorbit capability. Moreover, D-Orbit can be also used as backup in case of injection failure, guaranteeing fewer losses in terms of mission extension while still reserving sufficient propellant for end of life maneuvers. The D-Orbit module is now scheduled to be launched in space as a piggyback of a piggyback at the beginning of 2014. The flight will be used to test and qualify the core technology and the safety mechanism to ignite the engine. D-Orbit has also established a branch, D-Orbit Corporation, in Los Angeles. While the device sold by the European branch will be ITAR free to be saleable worldwide, D-Orbit Corporation will develop the same device with American technology, to address only American customers. D-Orbit Corporation is now looking for a consortium to apply for NASA or DARPA grants.